Rainy season makes you crave for something hot and spicy . Regular rice and curry takes a backseat. I am more of a chapathi/Phulka person. 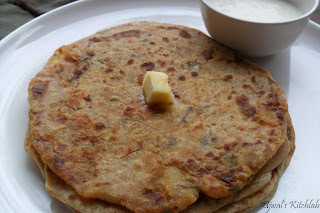 I love paratha's too. 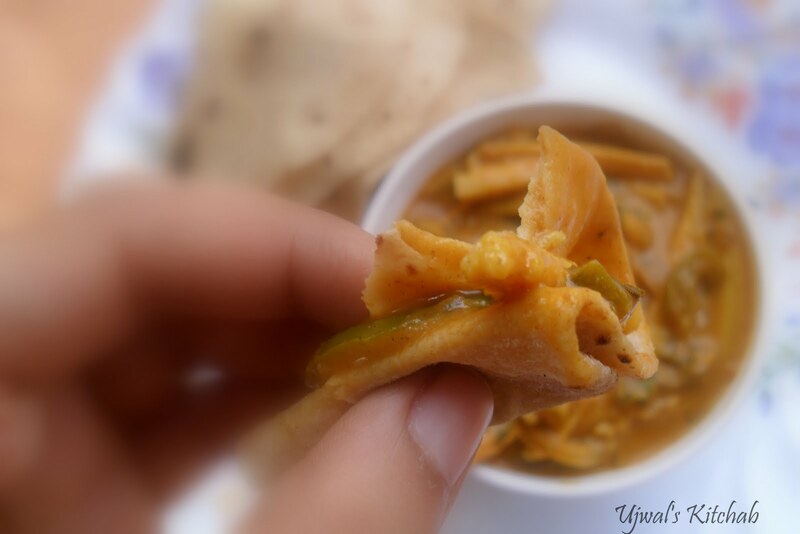 My mom makes awesome masala chapathi which is South Indian take on stuffed aloo paratha. I make both the versions. This is my version of aloo paratha a little spicy and little tangy. 1) I prefer to use warm water to knead my dough as it makes softer roti's. Mix all the ingredients for the outer dough and knead into a smooth and elastic dough. It should not be sticky. Add more water or atta as per your preference. 2) Boil, peel and mash the potatoes making sure that there are no lumps. Heat little oil and fry the onions till they turn slightly pinkish. Add in all the masala's and fry for a few seconds. Add the mashed potato and turn off the flame. Add salt to taste and add the coriander leaves. Let it cool. You can also skip frying the onions and use them raw too. I prefer this one than raw onions or skip onions completely. Incase you dont want to add onions just mix all the ingredients listed under the filling. Adjust seasoning according to your taste. 3) Make small balls out of the dough and same size balls with the filling. Out of the atta dough, roll a small puri and keep the filling at the center and cover it completely by gathering the puri over the filling. Roll it into slightly thick paratha by dusting it with sufficient atta to prevent sticking to the rolling board. 4) Transfer to a hot griddle and fry both the sides until golden brown by spraying oil, ghee or butter. Repeat with rest of the dough and serve hot with curds or curry of your choice. Rains are in full swing here and Little A is enjoying the weather. He loves to watch the rains but misses his evening outing. In Mangalore, it rains continuously at times and for days together. Hence going out in this rains needs a lot of planning. We avoid taking the little one out in this weather. This is also the time to experiment on spicy foods, fries and soups. Here is one such dish that I just made up with leftover veggies and it came out really good. I used a different masala this time called sabzi masala and the gravy came out really tasty. I had picked this up randomly during my recent grocery shopping. When the curry was cooking the house smelled heavenly. Pair it up with some hot rice or chapthis and make a meal out of it. Rains are in full swing here.Little A is enjoying the weather. He loves to watch the rians but misses his evening outing. In Mangalore, it rains continuously at times and for days together. This is the time to experiment on spicy foods, fries and soups. Here is one such dish that I just made up with leftvoer veggies and it came out really good. I used a different masala this time called sabzi masala and the gravy came out really tasty. When the curry was cooking the house smelled heavenly. 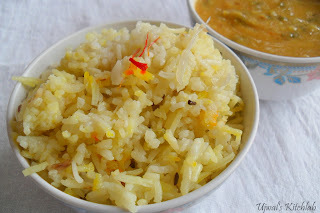 Pair it up with some hot rice or chapthis and make a meal out of it. 1) Grind the blanched tomatoes, cashews to a smooth paste with required quantity of water. 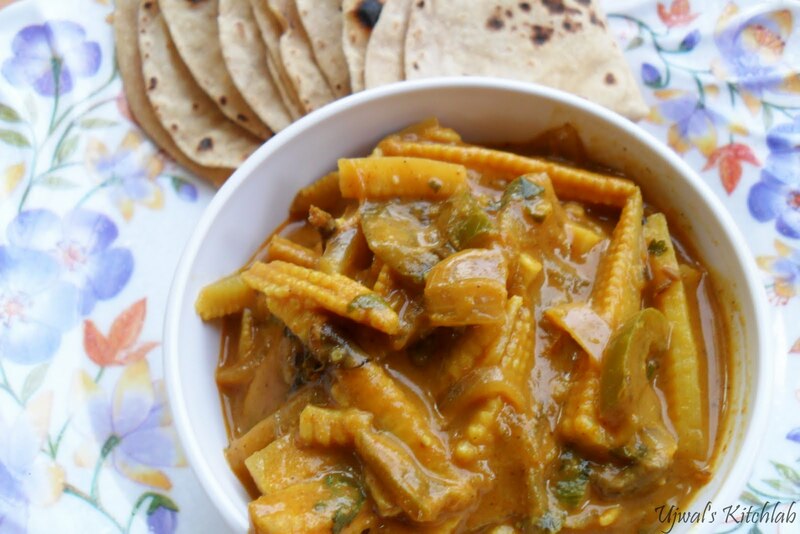 2) Cook the baby corn in sufficient water till almost done. 3) Heat oil, add bay leaf. After few seconds add in the Onions and fry till translucent. Add ginger garlic paste capsicum and mushroom. Fry until capsicum can be broken using a spoon and mushrooms have wilted.Add in the masala powders and fry till oil separates. 4) Add the tomato paste and cook further. Mix in the babycorn and give it a good rolling boil. Add in the kasuri methi and salt. Mix well, add sufficient water and check for seasoning adding any if required. Switch off and garnish with coriander leaves. Note: To enhance the taste of this curry milk or cream could be used. I skipped this completely as I am not too fond of cream based gravies. This curry came out so good that I see myself using this base gravy with many more vegetables. We enjoyed it with hot chapathis.